Emerson Records were founded by a Victor H. Emerson a former-employee of Columbia records. 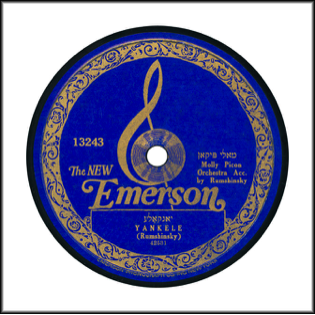 Emerson Records were part of the Emerson Phonograph Company (also founded by Victor Emerson). The first Emerson discs were 5.5in. and 7in. discs of various New York musicians recorded under the band name “Emerson Symphony Orchestra”. After World War One the business expanded to include 9in. and 10in. records. To market to the immigrants they created a line of 12in. classical records. Emerson then began to contract with musicians such as Eddie Cantor to record exclusively for the label. The rapid expansion after World War One coupled with a newly opened recording studio in Los Angeles over-extended the company. It would be bought-up by the Scranton Button Company in 1924. The Scranton Button Company would eventually stop selling Emerson Records and apply the Emerson name only to radios. Late Emerson records are very rare and are identified by a “Electrosonic Emerson” meaning Emerson switched to using microphones to record. This switch occurred as the Scranton Button Company was phasing the line out. By 1928 Emerson was no longer a label and parts of catalog were sold or leased to other companies. While the record branch would no longer exist the name Emerson and the factories that produced phonographs would be used to produce household electronics graduating from phonographs to radios then TVs, air-conditioners, and now other small consumer electronics. Indeed, Emerson exists today as Emerson Radio and includes the iconic over-sized treble clef as part of its logo. Music Genres: Classical, Pop, Ethnic, Foreign, Jazz, Urban Blues, and “Race-Records”. Numbers from label start to 1945: 300-10903 with the 19000 series being ethnic German music and the 12000 series being ethnic Italian music. Pre-World War II Label: Black, Blue, Red (being the Premier label designed to compete with Columbia’s Red Seal), or Maroon always with a shield. Black, Blue, Red (for Premier), or Maroon always with a shield. Emerson would have a label change mid-1923. The label would drop the shield and favor an oversized musical treble clef. Colors would be the same as the early Emerson label. Record Label: Mid-1923. The New Emerson label. Black or Red or Blue. With an oversized treble clef. -Emerson Records, a History and Discography.